Ideal for 1D analysis, the software has automatic lane and peak detection. 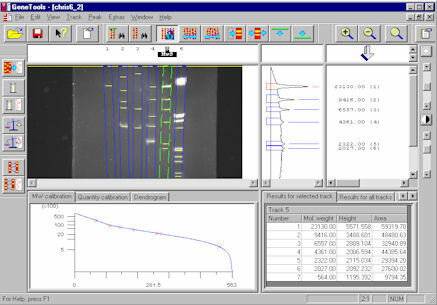 GeneTools software automatically compensates for smiling or distorted bands and tracks. Molecular weight or base pair values can be calculated using standards from one or more tracks. Quantification can also be automatically calculated from standards in a number of ways. Detailed results can be instantly printed or transferred to Word or Excel.